From Meat-free Monday to a Meatball Wednesday! 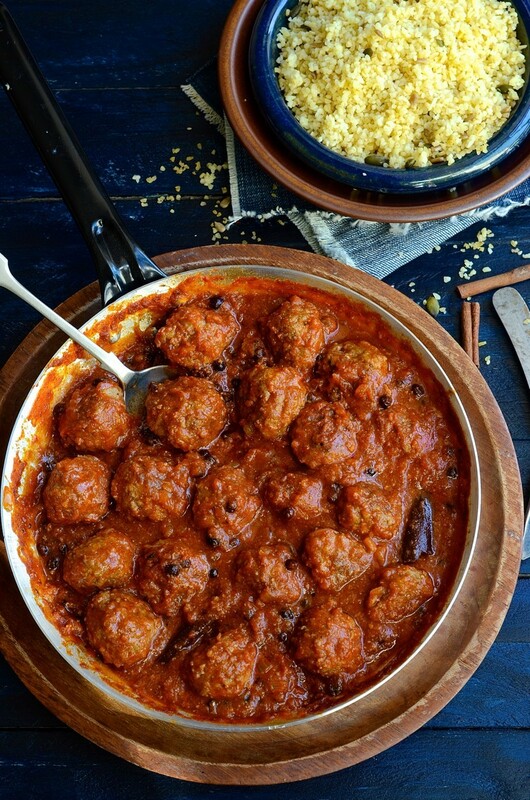 Everyone loves meatballs and I’m sure these North African Chermoula meatballs will soon become a family favourite. As South Africans, we’re familiar with the successful pairing of savoury and sweet. Red meat in particular works really well with apricots, peaches and dried fruits. With this in mind, I’ve combined a spicy paprika tomato sauce with succulent meatballs and sweet currants. It’s earthy, spicy and a complete taste sensation! Chermoula is a North African spice consisting primarily of cumin, coriander, paprika, saffron and cayenne pepper. It’s warm rather than fiery hot and can be used quite liberally as a dry rub on meats and for braai (barbecue) kebabs. Locally, you can find Chermoula at Food markets or Woolworths in the spice and condiment section. The rich tomato sauce has ‘mopping up’ written all over it. Warm Turkish flatbreads would come in very useful here. I serve the meatballs with a nutty, herbed bulgur wheat, but some fluffy mashed potatoes will be very comforting. 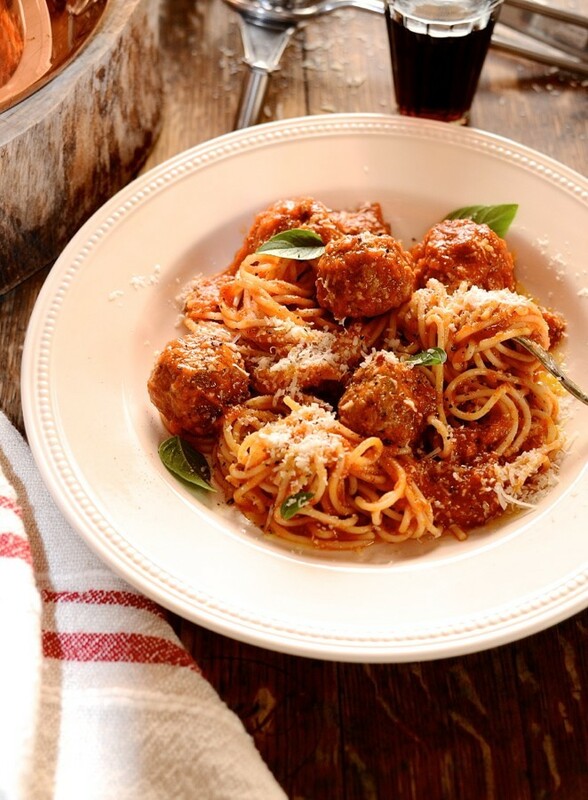 Adding white breadcrumbs to the meatballs helps to keep them tender and light. If you’re Banting, replace the breadcrumbs with almond flour, omit the currants and serve with cauli-rice. A great tasting sauce is a key accompaniment to the success of any meatball recipe and this tomato sauce is that – intensely red and rich. The recipe is quite adaptable so if you prefer, swap the meatballs for fish fillets or chicken pieces, in which case, you’ll need to add the Chermoula spice to the sauce. 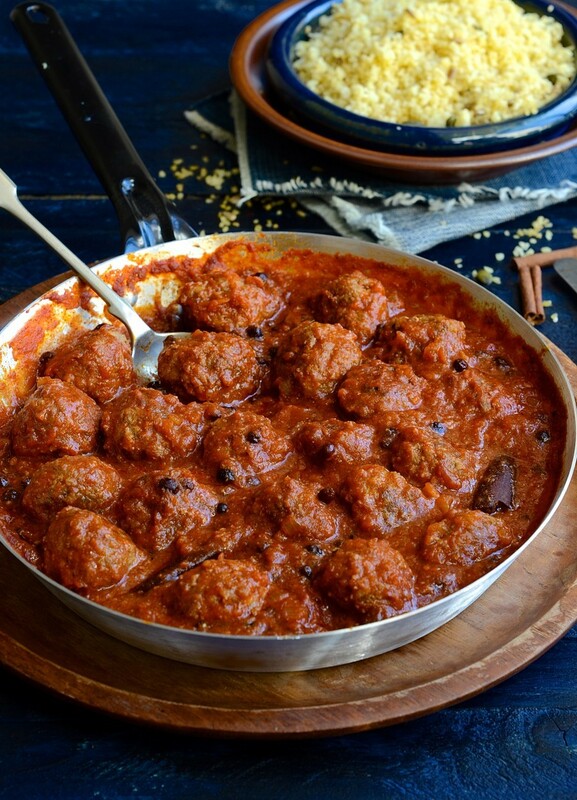 Either way, these meatballs are hearty, rich and very comforting. Place all the meatball ingredients into a large bowl and mix together by hand. Roll into evenly sized balls. Heat the olive oil in a large, non-stick frying pan. Brown the meatballs until they have formed a dark crust on the bottom. Turn and continue to brown on all sides. Shift the meatballs to the side of the pan and add the onion. Sauté for about 5 minutes until softened. Add the garlic and cook for another minute. Stir in the ginger, cumin, paprika, lemon zest, cinnamon and brown sugar. Turn the meatballs over to coat in the spices. Add the tomatoes, currants and chicken stock. Season with salt and black pepper. Simmer for bout 20 minutes until the sauce is reduced and the meat is cooked through. Serve with bulgar wheat or couscous and roast butternut, if you like. 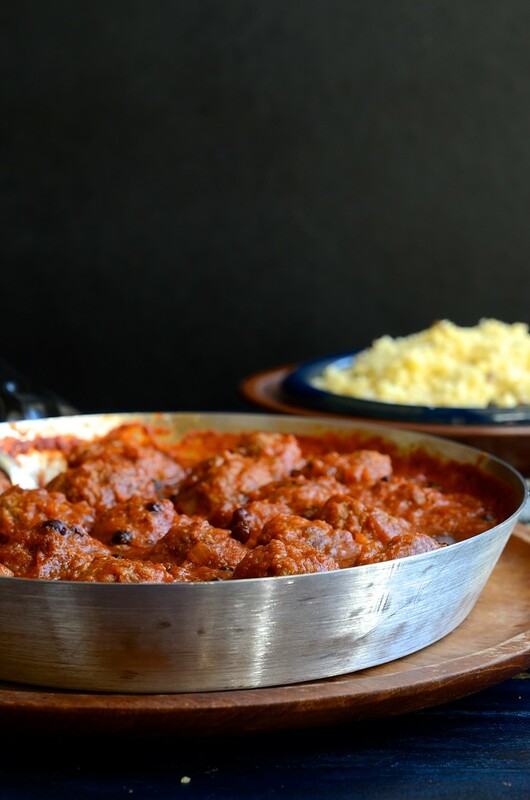 And my ultimate meatball recipe for a tapas-style party in a pan, Spanish meatballs. I don’t know what I love more…your recipe or the photography that goes along with it. Let’s call it a tie! This is a wonderful dish, Di. I’m a meatball girl, so this completely resonates with me! Thank you for sharing! Thank you Annie. I agree. There are just endless combinations for meatballs and it’s one dish that always ends in a scramble for seconds! We loved it Di, good comfort food for these cooler days. Good flavours, and meat balls are a favourite in our house. 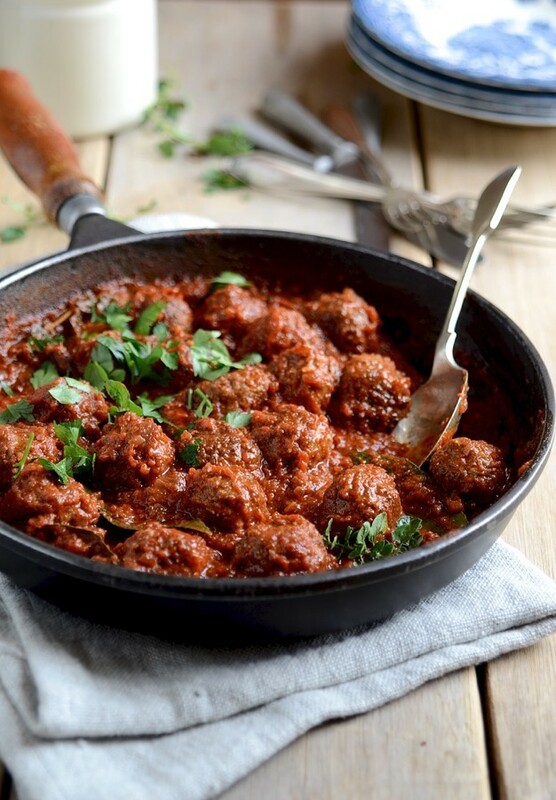 Who can resist pinching another meat ball while washing the dishes…..a scrumptious Sunday lunch. I’m so glad you enjoyed it Natelle. The dishwasher absolutely deserves special priviledges! These meatballs were divine! Can see them becoming a family favourite! Hi Lorna. So pleased you all enjoyed it. I must say, this is one of my favourite ways with meatballs. A great sauce is as important as the meatball itself. Lovely to hear from you! I love this recipe. I’ve made it several times already and once again tonight. Loved by the whole family, even our 4 year old. Made it with a slight twist to be gluten free (substituted bread crumbs for almond meal) and works perfectly. Delicious! Me too Sonja. 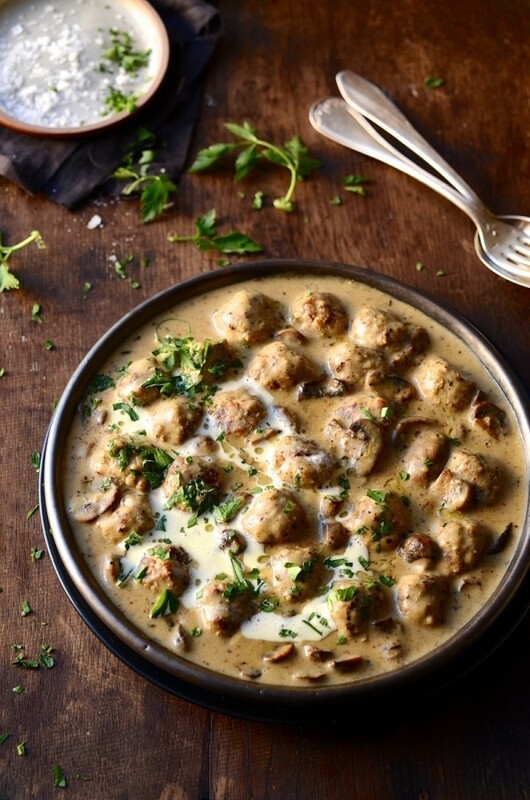 Meatballs are always a crowd-pleaser! The smoky North African spices in this recipe add so much flavour.